Manastira complex is situated on the beach and 100 meters from the Yacht port "Marina Dinevi". Top Aparthotel is located on the first line, only 10 m away from the sea and 50 meters from the Yacht port "Marina Dinevi" in St. Vlas resort. Berlin Beach Hotel is situated in St.Vlas Black sea resort, 5 km away from Sunny Beach, 20 m from the central beach and 500 m away from the "Marina Dinevi" yacht port. Breeze hotel is situated on the second line sea front, just 150 m from the Yacht Port "Marina Dinevi" and only 100 m from the sea coast. 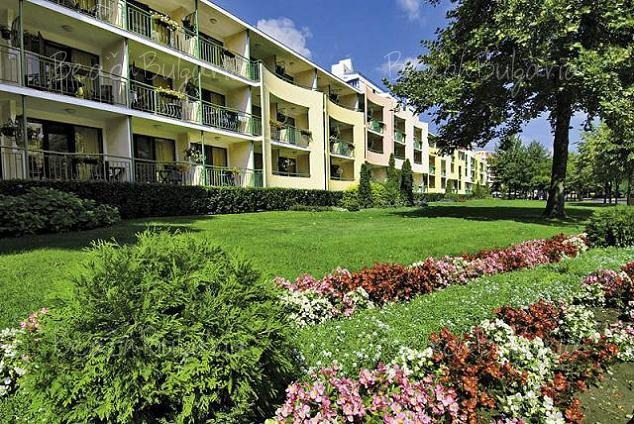 Lazur I, II and III complex is situated just 100 m away from the sea. 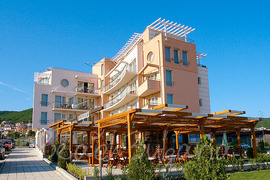 The complex offers gorgeous view of the Nessebar bay and Marina Dinevi - Sveti Vlas yacht port. They are located 150 m from the complex. Magic Dreams aparthotel is located approximately 250 meters away from the sea, in a quiet area between Sunny Beach and St. Vlas. The complex consists of three separate low-rise buildings with excellent architecture. Moonlight hotel is located 10 m from the private beach, 1 km from the centre of St. Vlas resort and 4 km from Sunny Beach resort. The bus stop is located in close proximity to the hotel. 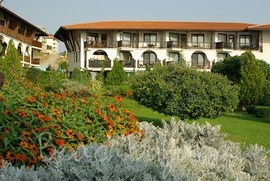 Location: Panorama Hotel is situated just 60 m away from the beach line in St. Vlas resort on the Black sea in Bulgaria. 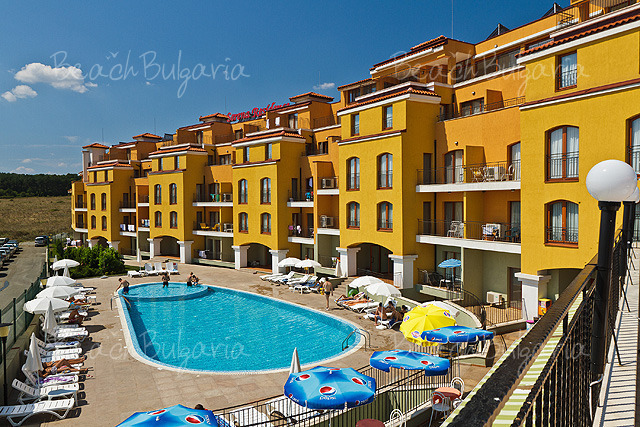 PrimaSol Sineva complex is situated close to the beach, not far from the Saint Vlas resort, 4 km from the centre of Sunny Beach and 10 km from Nesebar. 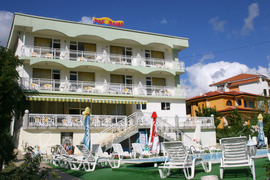 Sveti Vlas (St. Vlas) offers numerous hotels of different categories and prices. Most of the hotels offer all inclusive accommodation. Most of the hotels in Sveti Vlas feature large indoor and outdoor swimming pools for adults and children, various restaurants, bars and night clubs, children clubs and playgrounds, sport facilities on the beach, conference halls and business centres and other facilities for summer holiday on Black sea coast. Browse the hotels and their facilities in the list below, choose a hotel, fill in the booking form and we will contact you as soon as possible.